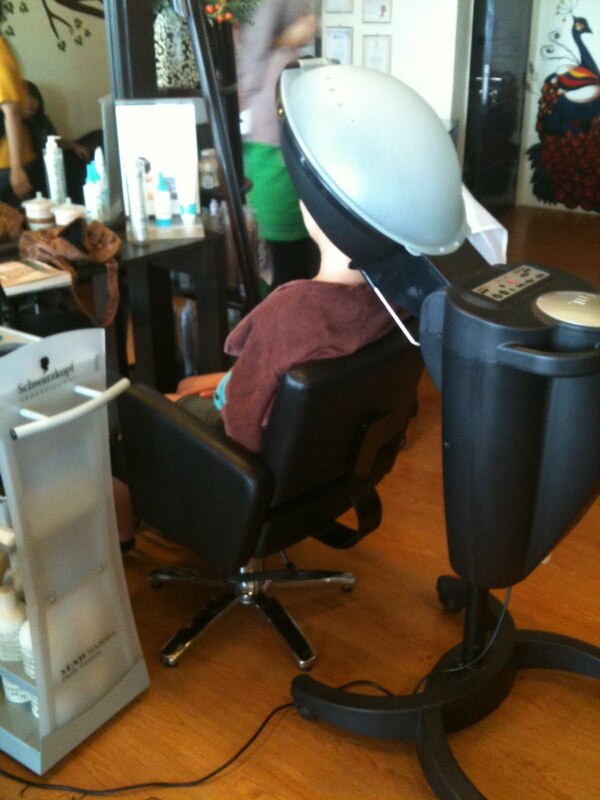 While I was in KL, my sis brought me to salon to had my hair cut done. I actually went with my mom and sis. So, i was sitting there reading magazine while waiting for mine to be done. Out of no where, the Mr. 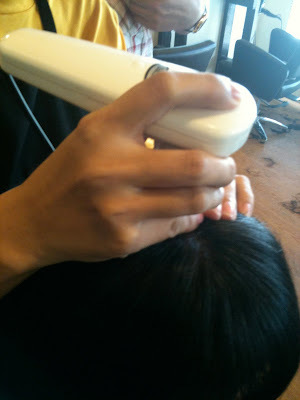 Hair Dresser started pulling out this machine and scanned my sis's scalp! I was like what the heck is that! 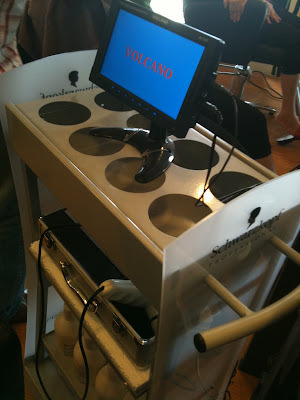 This machine is so cool, it can view CLOSE UP onto your scalp to see if your scalp is healthy or not! My sis's scalp is pretty good compared to mine. Mine is literally HORROR. It's so oily, like someone just rub a tub of lard into my head! You can't imagine how terrible it is until he magnified your scalp and show you on the screen. The hair dresser himself was shocked to see how oily my scalp is and told me that it is quite serious if I don't cure it. Why is it so serious? I have been having this since I was young and wash hair daily can make my hair clean again! Never had a problem with it..! Yes.. oily is okay.. not until he told me..
"The oil will cover the pore and stopped your hair from growing because it's blocked!" I felt sick of my scalp after seeing it and I was like screaming in my head "Mr Hair Dresser!!! Please cure my oily scalp!!!" He then asked his assistant to do a head spa for my scalp. It's quite a tedious process. 3 different steps using the bottle in blueish green colour. Squeeze the liquid onto the scalp from the 1st bottle section by section (Very detail) then massage my scalp, then wash. Repeat the same process with the 2nd and 3rd bottle. 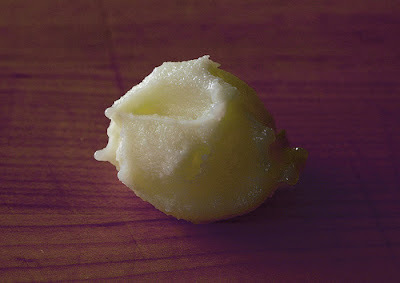 Of course to speed up the process and to thoroughly clear my oily scalp, he used this thing below. The process is better to be done every week for 4-5 weeks, in order to make sure your scalp is healthy. It wasn't expensive as well. For beautiful hair and having a healthy scalp, I think it's definitely worth it. As you know I'm only in KL every once or twice a year, I can't do the "Schwarzkopf BC KUR" which is the Head Spa that I did, for 5 weeks. 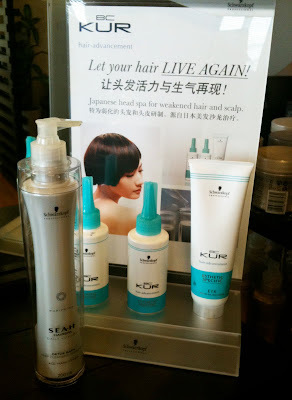 So, he recommend me to use Schwarzkopf SEAH Detox Shampoo to maintain the PH for my scalp (avoid dropping more hair!) until I go back next year to do another scalp treatment. My scalp feels not as oily anymore after the treatment and not dropping as much hair like last time anymore. Very happy with the result. If you have the same problem like mine, oily scalp/ dry looking hair/ slight hair loss or any problem at all, go and have a check with the trustable Mr "Hair Dresser" Daniel Seet from La Vie Hair Saloon. NW-02-11 Cova Square, Jalan Teknologi, Kota Damansara PJU5, 47810 Petaling Jaya.